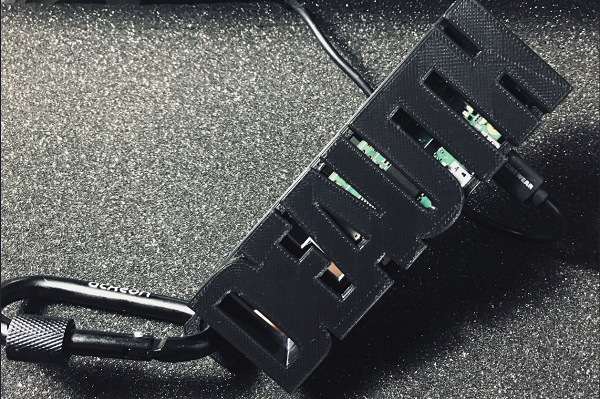 A few days ago I started playing with some idea I had from a few weeks already, using a Raspberry Pi Zero W to make a mini WiFi deauthenticator: something in my pocket that periodically jumps on all the channels in the WiFi spectrum, collects information about the nearby access points and their connected clients and then sends a deauthentication packet to each one of them, resulting in some sort of WiFi jammer on the 802.11 level. As an interesting “side effect” of this jammer (the initial intent was purely for the lulz) is that the more it deauths, the higher the changes to also sniff WPA2 handshakes. See the full post on Evilsocket blog. In the previous posts I explained how to receive and send advertising packets based on the Bluetooth LE standard. The payload (that is the amount of “useful” data) of those packets is at most 31 bytes. It isn’t much: if – for example – you want to include the device name, little place remains for other data. The BLE standard allows peripherals to send additional data using the scan request – scan response process. 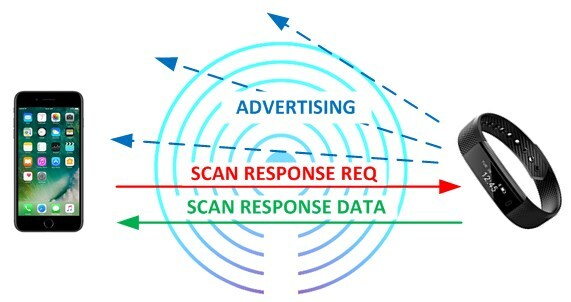 Advertising and scan request packets have the same format; it’s therefore possible to transfer, using scan response, additional 31 bytes of data. The esp framework offers two modes for configuring the content of a scan response packet: using the esp_ble_adv_data_t struct or creating a byte array (raw mode). These modes are similar to the ones used to configure advertising packets you learned in previous articles (struct and raw mode). Very important is set to true the set_scan_rsp parameter. It’s indeed this parameter what tells the driver that this struct is related to the scan response packet. 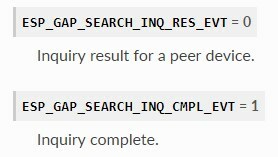 did you notice that the content of the scan response packet is the same in the two examples? You can also mix the two modes in your program. For example you can configure the advertising packet using the struct and configure the scan response one using the raw mode. 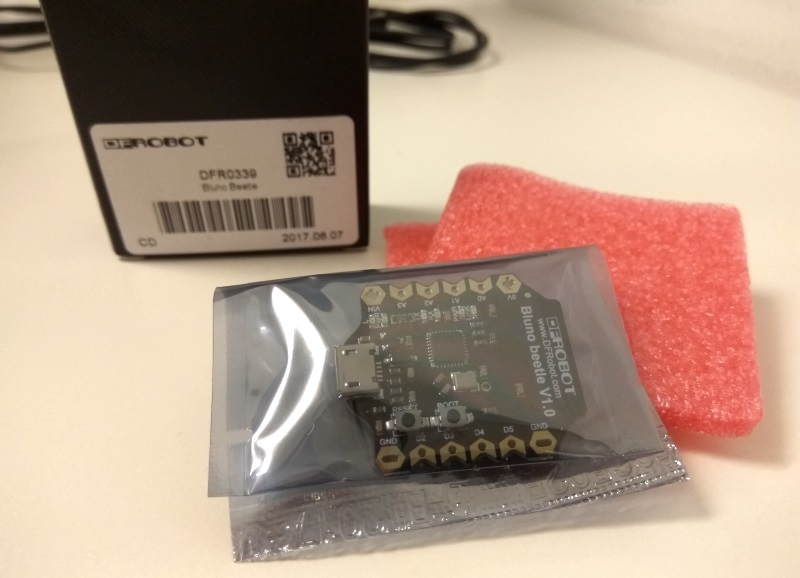 In the previous post, you learned how to send BLE advertising packets with the esp32 chip. Although there are many fields available, sometimes it is necessary to be able to define the content of the advertising packet arbitrarily. For this reason, the esp-idf framework provides a raw mode. For the advertising process to work, the data contained in the array must correspond to a valid payload. 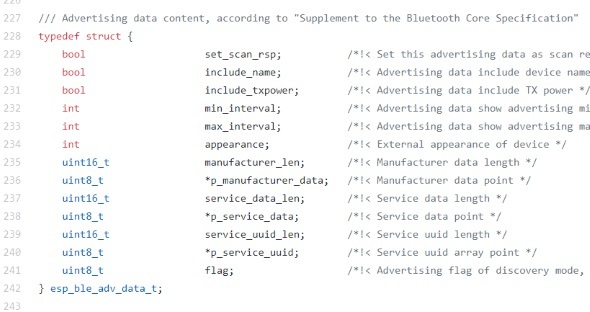 The codes that can be used to define the type of data can be found in the Bluetooth specifications. Depending on the type of data, it is then necessary to apply a particular format to the data that follows. 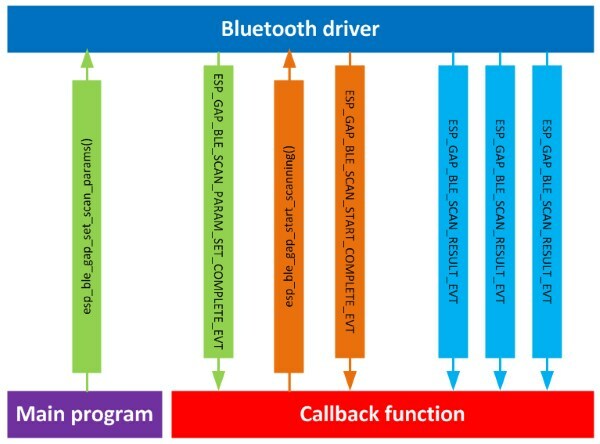 The necessary information is found in the Core Specification Supplement document (available on the Bluetooth.com website). Let’s see a simple example: the ADType 0x09 represents the complete local name, which is the name of the device. This name must be specified in AD data with simply a sequence of the ASCII codes that correspond to the different letters. The first byte has value 0x06 that is the sum of the name length (5 bytes) and 1 byte for the data type (0x09). In the following video you can see how I use the raw advertising feature to simulate the advertising packet of my iBeacon and therefore I’m able to activate the relay as in the previous example. The source code of the program is available in my Github repository. 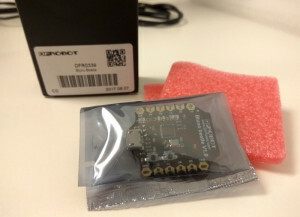 In the previous posts you learned how to use the esp32 chip to receive and parse the advertising packets transmitted by BLE peripherals. As a practical example, I developed a program to detect the presence of a particular iBeacon and activate an output accordingly. In today’s tutorial, you’ll learn how to transmit advertising packets instead. You’ve already discovered that the Bluetooth driver included in the esp-idf stack is executed in a dedicated thread. Whenever the driver needs to send a notification to your program, it calls a callback function indicating which event has triggered. The meaning of the different fields is explained in the Supplement to the Bluetooth Core Specification document. After configuring the content of the advertising packet, you have also to tell the driver how to send the packet. 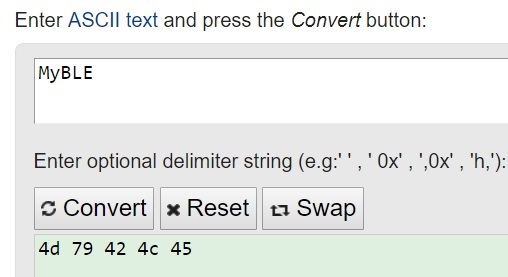 You can configure the minimum and maximum transmission interval of the packet. The two parameters can assume a value from 0x20 to 0x4000. To calculate the interval in milliseconds, the value specified must be multiplied for 0.625. This means that the minimum value (0x20) corresponds to an interval of 12.5ms. The esp_gap_ble_api.h file lists the constants that can be used for the other parameters (esp_ble_adv_type_t, esp_ble_addr_type_t …). I prepared a program that includes what explained above. The source code is available in my Github repository. In my previous article I explained the Bluetooth Low Energy technology and the advertising process. 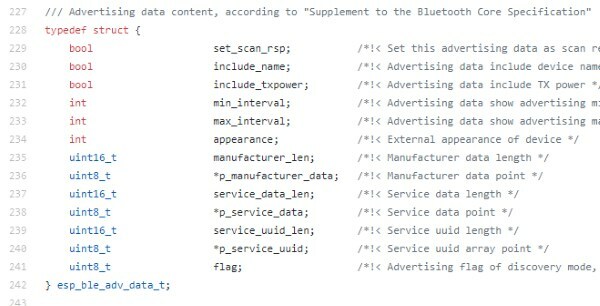 You learned that a BLE device can leverage the advertising packets to send data; in this case the device is called broadcaster and the devices which receive data are called observers. 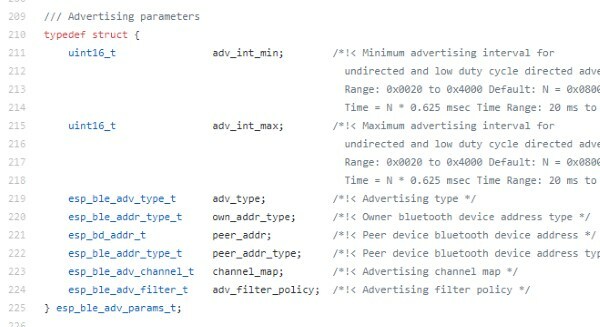 The official website of the Bluetooth Special Interest Group lists all the available AD types. 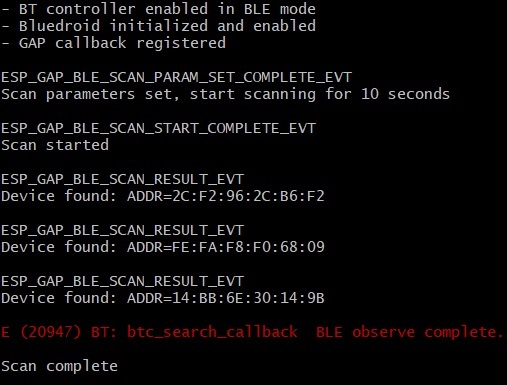 In scan mode, the Bluetooth driver returns to the program the received data (ADV DATA) in the scan_result->scan_rst.ble_adv array. This array contains uint8_t values and it’s size is scan_result->scan_rst.adv_data_len. A particular family of broadcaster devices are the iBeacons. These devices have been designed by Apple to allow interaction with IOS devices (iPhone …) based on location awareness. 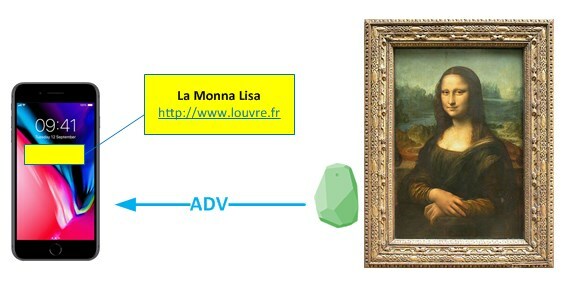 Let’s make an example: an iPhone can “notice” that it is close to a particular iBeacon, associated with a room in a museum, and therefore offer the user a brief guide to the exhibited works. The first structure has AD type = flags (0x01). Each bit has a different meaning, usually iBeacons use 0x0A value for AD data. The second structure has type = 0xFF, that is Manufacturer Specific Data. The Bluetooth standard allows the different manufacturers to use this ID to transmit custom data. The total data length is 25 bytes (0x1A – 0x01 that is the length of the AD type field). The first field is the manufacturer/company; iBeacons normally use the code 0x004C, assigned to Apple Inc. The next two fields define the iBeacon type and have a fixed value (0x02 e 0x15). The UUID field, together with the Major and Minor ones (optional, they can have a value of 0) uniquely identifies each iBeacon. 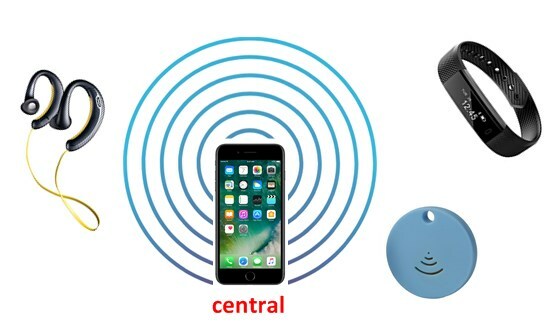 (insieme con i campi Major e Minor (facoltativi, possono essere impostati a 0) identificano univocamente il singolo iBeacon. Finally, the TX power field contains a measurement, one meter away from the iBeacon, of the received power and is useful for precisely estimate the distance between the phone and the iBeacon itself. I developed a program for the esp32 chip which turns a relay on if it detects a specific iBeacon. Via menuconfig you can configure the UUID of the iBeacon which triggers the led, the pin the led is connected to and the timeout – in seconds – after which the program turns the led off if the iBeacon is not detected anymore. You can moreover set a power threshold to control the distance at which the iBeacon is detected. To parse the received packet and get the UUID value, in my program I used the method described in this article (parsing using a struct). In my previous tutorials you learned how to use the wifi interface of the esp32 chip. 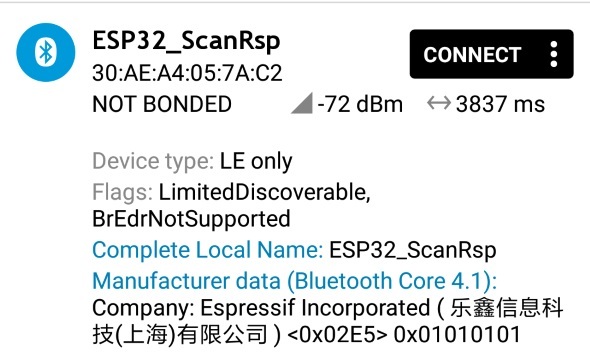 Starting from this post, I’m going to explain you the second wireless technology the esp32 chip supports: bluetooth. 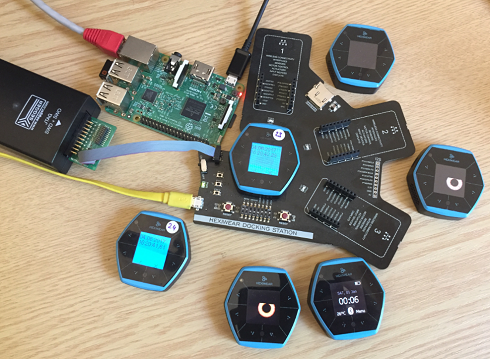 BLE is a technology to build personal wireless area networks (WPAN); that is it allows to put in communication different devices (computers, smartphones, smartwatches…) “close” to each other (a theoretical maximum distance of 100m). 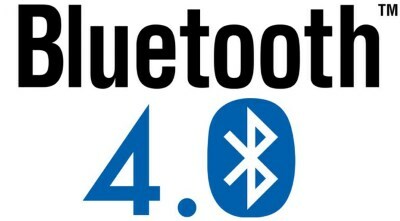 As the name suggests, version 4.0 of the Bluetooth standard was designed to reduce the power consumption of the devices connected to the network. BLE devices periodically report their presence by transmitting advertising packets. The advertising packet can contain up to 31 bytes of data and the transmission frequency can be chosen by the single device: reducing this frequency can indeed reduce energy consumption. 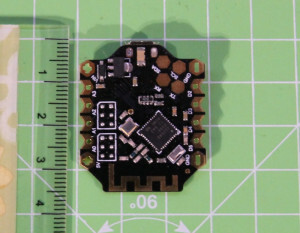 A BLE device can take advantage of advertising packages to send data in broadcast mode. In this case, this device is called a broadcaster, while the devices that receive the data are called observers. What explained above is defined within a BLE specification called Generic Access Profile (GAP). In this first tutorial you’ll learn how to develop a program that will periodically scan the air looking for BLE devices, that is a program which receives advertising packets and displays the data received in the serial console. In a similar way to what you learned about the wifi driver, the bluetooth driver also runs in a thread separate from our program and communicates with it via events. In order to receive such events, you have to implement a callback function. Whenever the bluetooth driver has to notify an event, it will call that function. When the driver has finished the configuration, it calls the callback function with the event ESP_GAP_BLE_SCAN_PARAM_SET_COMPLETE_EVT. Depending on the event raised, the callback function also receives some parameters. The framework’s Programming Guide explains – for each event – the related parameters. For this event, it’s available the variable scan_param_cmpl that contains only the status parameter. The parameter is the scan duration (in seconds). 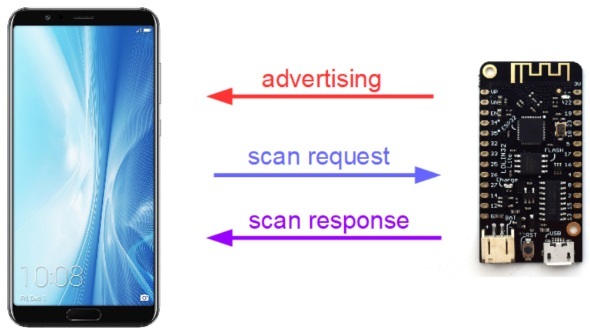 During the scan process, for each advertising packet the chip receives the event ESP_GAP_BLE_SCAN_RESULT_EVT is raised. the first tells you that a device was detected, while the second one that the scan process completed. 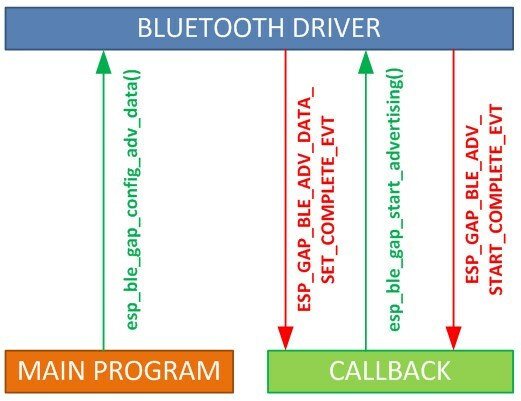 As explained above, the ESP_GAP_BLE_SCAN_RESULT_EVT event is raised everytime a device sends an advertising packet. This means that a single device will be detected multiple times during the scan process. It’s therefore necessary to maintain a list of the known devices. In my Github repository you can find a test program that scans the network and prints all the detected devices. 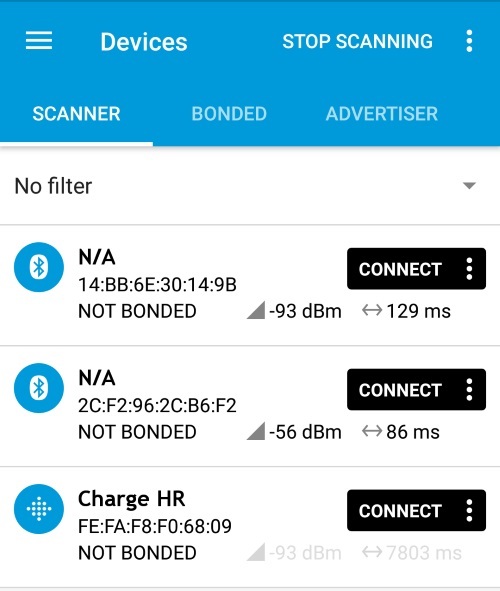 You can verify if it works correctly comparing what the program detects with the BLE devices listed by a smartphone… for Android for example you can use the very good nRF Connect application by Nordic. Some time ago my friend Mauro Alfieri showed me an interesting development board produced by DFRobot and called Bluno Beetle (now Beetle Ble). It seemed the perfect board to start “playing” with the Bluetooth Low Energy (BLE) technology; therefore I ordered one board directly from the DFRobot store. The CC2540 chip is actually a real microcontroller that runs a firmware developed by DFRobot. This firmware can be configured using AT commands. Normally the firmware runs in transparent mode, that is it acts as a “bridge” between the USB/BLE interfaces and the ATmega microcontroller. If you then connect the Bluno to your PC and activate the serial monitor, each character you type is forwarded to the ATmega and viceversa. To exit the AT mode and go back to transparent mode, you have to send the AT+EXIT command. 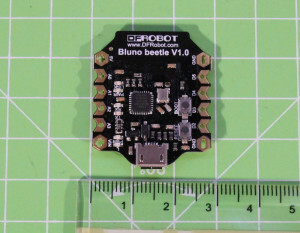 In transparent mode Bluno transmits via BLE each byte it receives from Arduino (the ATmega microcontroller) and – viceversa – it sends to Arduino each byte it receives from BLE. 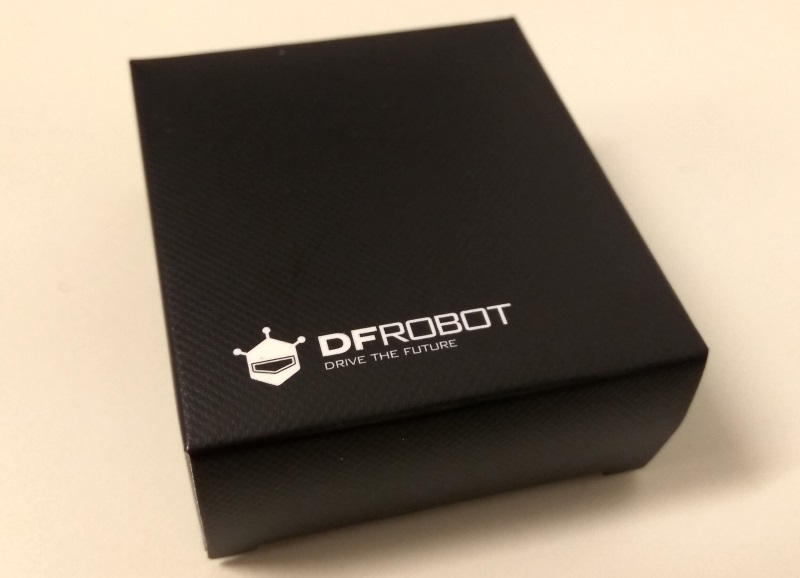 In this first post let’s explore the demo application DFRobot provides; in a future post I’ll explain how to develop your application to interact with Bluno Beetle via BLE. 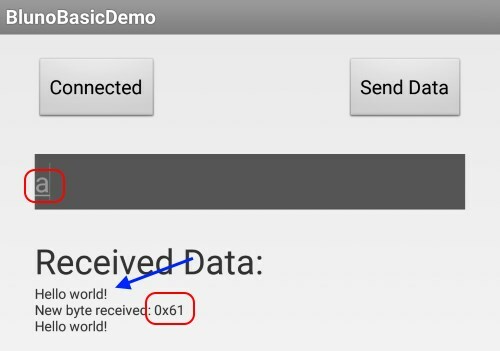 If you have an Android smartphone, you can directly install the apk file for the application named BlunoBasicDemo (application of which the source code is also available). In the same Github repository you can also find the source code of the iOS application, you have to compile by yourself. The sketch reads the incoming bytes (coming from the app) and sends back to the app their hexadecimal value. Every 10 seconds moreover the sketch sends to the app the text Hello world!. Bluno also supports the HID (Human Interface Device) mode. When running in this mode, Bluno simulates an input peripheral (keyboard, mouse…) connected via BLE. you can send up to 3 different keys at a time, concatenating their codes with the + character. The codes to be used, according to the type (page) of the HID device, are listed in the USB specification. The AT+KEY command notifies the pressure of a key on the keyboard. It is therefore necessary, after a few moments, to send the AT+KEY=0 command to indicate that the key has been released; otherwise on the PC associated with Bluno you’ll see the character appear repeatedly! Using two different AT commands you can enable the debug mode of the firmware. 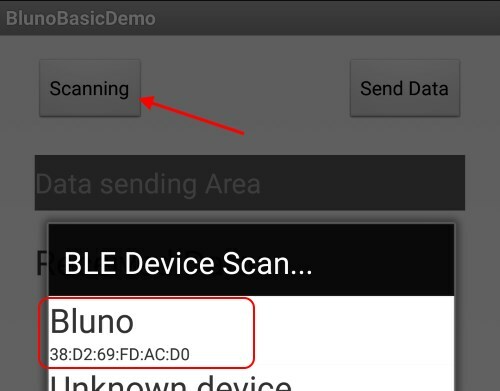 This mode allows to receive – via the USB connection – a copy of all the data sent and received through the BLE connection. By default the first debug mode is active, while the second is disabled. You can verify it if you upload the sketch listed above: in the serial monitor you’ll see the Hello World! sentences but not the characters sent by the app.